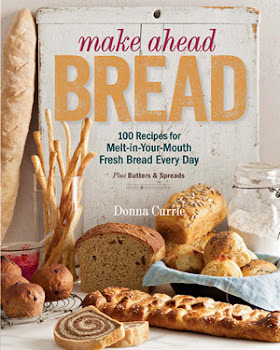 The first version of my book proposal included some quick bread and muffin recipes, but after some discussion, it was decided that we'd focus on yeast breads rather than splitting the book between chemically leavened and yeast leavened. To be honest, I like the current concept better. It's more tightly focused. And you know I love yeast breads. Mmmm. Yeasty. But I also love muffins, quick breads, biscuits, and all the other baked goods. Biscuits are like emergency bread. You can make them very quickly ... but ... but ... you can enhance their flavor by letting them hang around for a while. And the texture is different as well. Give this method a try and see what you think! The easiest biscuits of all, drop biscuits, don’t require any rolling, folding, shaping, or cutting. They aren’t the pretty in the traditional sense, but the hills, valleys, and craters have a rugged beauty all their own. And the ingredient list is short. Place the flour in a medium bowl. Add the butter and cut with a pastry cutter or two knives until the butter pieces are no larger than small peas. Add the milk, stir to combine, just until all the flour is moistened. Cover the bowl and refrigerate until morning. Yup, that's what I said. Cover and refrigerate. The flour will hydrate during the long rest and you'll end up with better biscuits. Try it, and let me know what you think. Or, obviously, you could bake these right away. Your choice. When you’re ready to bake, preheat the oven to 400 degrees. Line a baking sheet with parchment paper. Using a disher or a large spoon, portion the dough into 8 equal mounds on the baking sheet, leaving space between them. Flatten the biscuits slightly. Bake the biscuits at 400 degrees until golden brown on top, about 25 minutes. Take the biscuits out of the oven and put on a rack. Serve warm.